Of all the places I had expected David Kennedy to resurface, Ladhar Leisure’s Pleased To Meet You was the least likely. The chef’s name has been erased from the doors of his restaurants at the Biscuit Factory, Vallum Farm and River Café on North Shields’ Fish Quay. I half expected Kennedy would re-emerge to launch some tie-in project with superstar veg-grower Ken Holland, perhaps at a destination site in Northumberland. They are the pioneers of grow and eat local in our region. 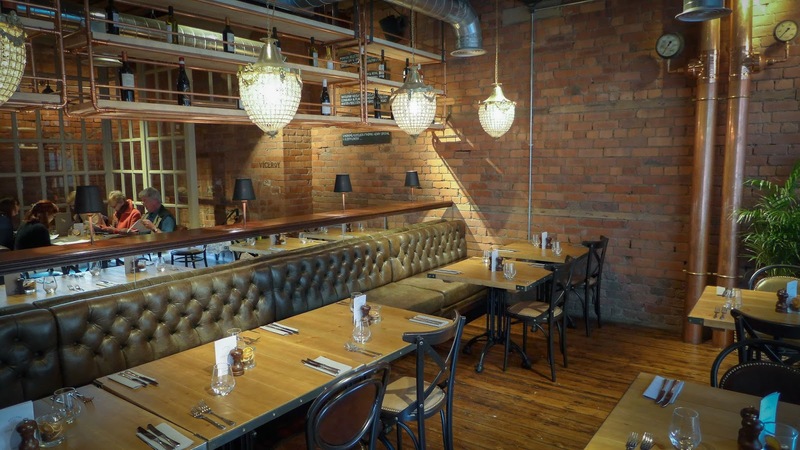 But no: here he is instead in the newly extended restaurant section of one of the first bars in Newcastle that sussed out how lucrative gin and craft beer could be when set against a backdrop of exposed brick and air duct. Kennedy has been a stalwart of Newcastle’s restaurant scene for as long as I can remember. I’ve eaten at all of his previous restaurants; the original Black Door served over-ambitious food to too few people, while his later ventures established his own brand of smart bistro cuisine — good raw materials with solid cooking, often at a reasonable price. Quite why these places didn’t work out, I’m not sure. I’ve always thought his food was better than his front of house and management skills. 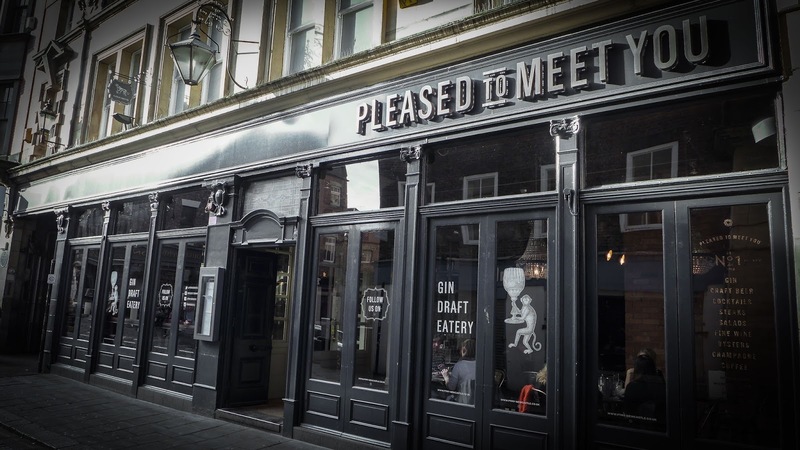 But I feared that his engagement here — it doesn’t exactly have a gastro image and it's just a stone's throw from the nightmare of Bigg Market — might jeopardise his reputation as one of the North East’s best cooks. Happily not, at least on the evidence of our recent visit. 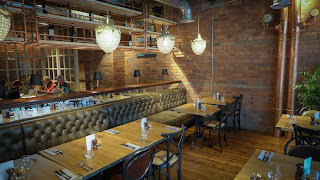 On a Friday afternoon we slunk into one of a number of tan leather booths - I do like a good booth - and were presented with a choice of menus, including a daytime set offering of three courses for £18 featuring a bacon chop that looked like very good value. The à la carte was the type of list into which I could happily stick a pin at random. 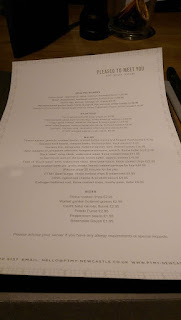 Scallops with chicken wings and jerusalem artichoke were available as a starter for just shy of eight quid; a main of grilled Dover sole on the bone was a bargain at fifteen. I inwardly tutted at the inclusion of a set of “grazing boards” - since when did we all become ruminants? - before we ordered from across the range. Simple things were done well. 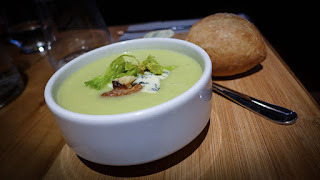 The cream of celery soup from the set lunch was properly made, with impressive depth of flavour. Blue cheese and walnuts go perfectly with celery, so it was cheering to see them used here as a garnish. An à la carte starter of crisp goat cheese bon-bons and dressed green beans was dinky to the point of parsimony, but well made and neatly presented. I particularly enjoyed a thieved corner of Mrs Diner’s smoked salmon rillettes. This tidy slice was studded with tiny dice of perky red pepper, and had been removed from the fridge a sensible period of time before service. That’s the sort of detail I appreciate. 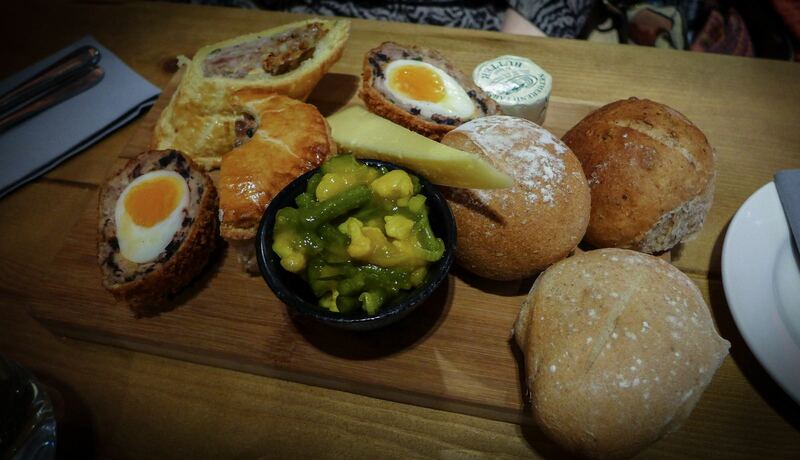 I may have objected to the phrase ‘grazing board’, but there was nothing to get upset about on the plank itself. It paired some excellent cheese - possibly Reiver, or one of Doddingtons maybe - with the pub classics of a scotch egg, pork pie and sausage roll. While the Broad Chare retains the crown when it comes to this type of thing, this was nonetheless a triptych of top quality pig. Extra marks for the accompanying piccalilli that was as good to eat as it is fun to say. Much more skill was required in the production of my main course. 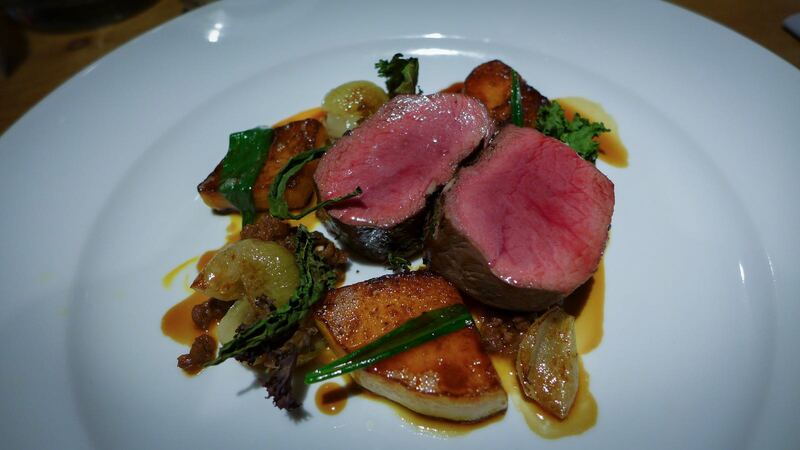 This was classic Kennedy: loin of venison was cooked to a viscerally ripe scarlet and had the faint livery funk of very good deer. 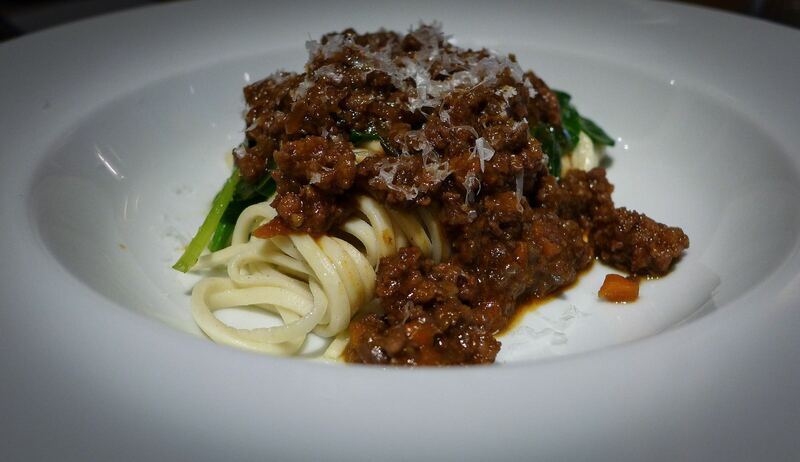 Beneath it was a ragù of the same beast and a fine jus that added depth. In the interest of pickiness I should note that wodges of butternut squash were slightly undercooked and kale was more dessicated than crisped, but this was still a fine plateful. The same venison ragù reappeared atop Mrs Diner’s plate of perfectly cooked home-made linguine, which I enjoyed as much as she did. I wondered about the extent of Kennedy’s involvement. Had he just consulted on these menus, or was he actually cooking them? I politely enquired as to whether Chef Kennedy was in the kitchen, and was politely informed that indeed he was. I believed them: seasoning was correct in all the dishes we tried and presentation was spick and span. Ladhar have made a good signing. By going for a chef of some note, they have successfully differentiated and up-scaled the food offering here. 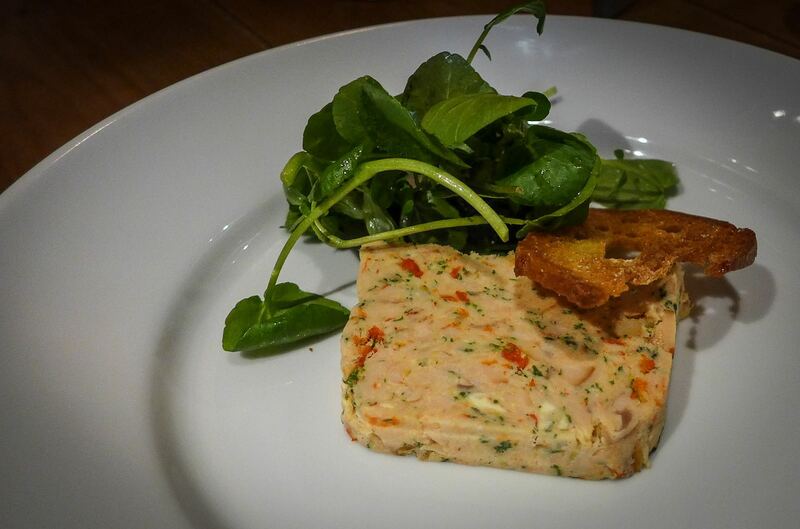 Pub grub sits alongside restaurant cooking, and it’s all impressively good. Even the chips, which we’ve always found far too pale and flaccid to deserve the “thrice-cooked” moniker at Kennedy’s other venues, were excellent. 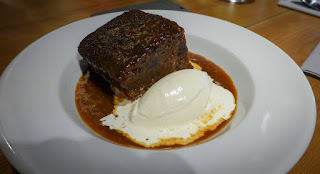 The one dessert we tried was an on-the-money sticky toffee pud, a light sponge bathed in a puddle of violently sweet sauce alongside a quenelle of rapidly melting vanilla ice cream. Rapidly melting, and even more rapidly eaten. Service, from a Romanian student, was warm and assured. It was too early to drink wine, and anyway we were both driving, but the list looked to have some interest about it and was fairly priced. Fans of gin, beer and cocktails will be very well served by the main bar next door. My understanding is that the Ladhar group have further development plans afoot in Newcastle’s city centre, and perhaps Kennedy will be part of that longer term vision. In the meantime, it was good to get reacquainted with his reliable combination of French-ish technique and good British product. His name may not be above the door, but it’s on the menu, he’s in the kitchen, and these are two reasons alone to set a course for High Bridge. I've eaten at loads of his restaurants. The food is always great but he never seems to stop anywhere for long. SECRET DINER, YOU HAVE A LOT TO ANSWER FOR! Based on this review, for our 6th month anniversary, my boyfriend + I decided to go here, we're v. cheap eaters normally only going to to Zapatista / Nudo Sushi / Crepe Affaire for food + drinks, then heading to Quilliams for tea + cake. But no, we would save up money and be like real fancy restaurant goers and go to a fancy restaurant, the sort critics review, and since I read your reviews like a vicarious TKMaxx buyer reads Vogue, I suggested PTMY and we happily booked a table for two. Still, we smiled at our less than committed waitress, and looked forward to the food that would be wonderful + everything would be okay. When our mains arrived, mine was fine, but my bf's vegetarian option was a bit small + simple looking for the only veggie option. Still, neither of us said anything, and ordered our long anticipated desserts, myself sticky toffee pudding (good but not as good as some I've had), but alas again my bf got the short end of the stick, his cheesecake was small (I wish I'd measured it so I could tell you how small it was). It was cut in a thin strip, just thicker than your thumb + a bit longer than your mobile phone. It was too small, made even tinier by the huge plate it sat on + my looming nearby wedge of sticky toffee pudding. 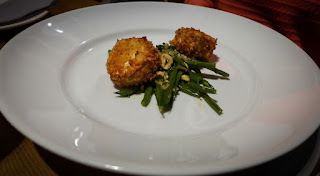 Thing is, as great as my food was, I couldn't enjoy it, as every bite made me feel guilty at how disappointing my boyfriend's meal had become. I understand that they might value quality over quantity, but still that tiny cheesecake was not amazing enough to be that small. If every bite had been delight I'd have been fine with it, but it was just a good small cheesecake, not worth its high price. I offered for him to finish off my sticky toffee pudding, then we quickly asked for the bill and left. The evening was saved again by a trip to Quilliams, their cakes are wonderful. I recommend the Tunisian Orange. I demand you investigate this cheesecake!!! (The veggie options as that wasn't great). You have to tell me whether it's just that my taste buds aren't experienced enough at fine cuisine to taste its magically properties and understand why it was so small for so much, or whether it really was a stupidly tiny slice. This is an occasional regular lunchtime choice of my office & friends group when drinking and (sometimes) dining on Fridays. Today we enjoyed, yet again, an excellent experience, with massive, fresh as you like, fish & chips and a lick-the-plate-clean beef dish with root veg and greens that sang with umami & comfort. Quiet today - shouldn't have been! Lovely service as well.